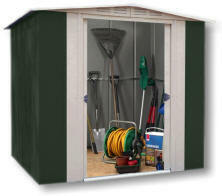 The Grandale 'Six' metal shed is available in 5 sizes - 6x3, 6x4, 6x5, 6x6 and 6x7, and all are manufactured throughout with hot-dipped-galvanised steel. All buildings in the Grandale range are supplied pre-finished in a maintenance free Dark Green with White Trim. Our Grandale 'Six' steel sheds feature vented gables to help combat condensation, and are designed with uncomplicated assembly in mind. The buildings are designed to have lasting good looks, and won't crack or warp. They are both rot and rodent proof and won't need any maintenance. The double sliding doors on the Grandale 'Six' range open to 69cm wide, and when closed the handles come together to allow the doors to be padlocked.